I found this ingenious Round Float Table at a store called Area 51 in Seattle, Wash. I say ingenious because the leaves of the table (the wooden parts on either side of the center glass) actually fold in on themselves and tuck away under the table, making this ideal for small homes. The frosted glass lends this piece more warmth than many other glass tables we've seen, and the dark wood means it will fit in with different styles. 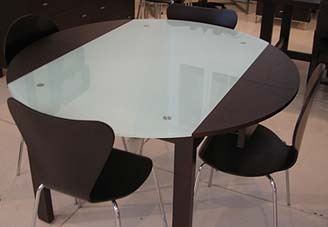 The table is 51 inches in diameter when fully opened. At $395 I consider this table a bargain. The chairs in this picture are optional accoutrements, and I recommend passing on them. They're inexpensive, and that's nice. What's not so nice is that they look inexpensive. Which is to say, cheap. Taken at Area 51 in Seattle, Wash.